Financial issues meant young mum Rosie and her five kittens, who were just 10 days old, were signed into Gosport CP care in July 2018. One year old Rosie, a tiny torby (mix of tabby and tortoiseshell) had a colourful litter of babies with their CP names being for the ginger boys Rufus & Stanley, tabby girls Ruby & Pearl and Jackson the only black kitten. They were all confident kittens and very soon were exploring every inch of their foster pen determined to keep up with Mum. There was no holding them back and weaning them onto solid food was a joy to behold; enthusiastic eaters who weren’t shy about stepping into the dish at times! 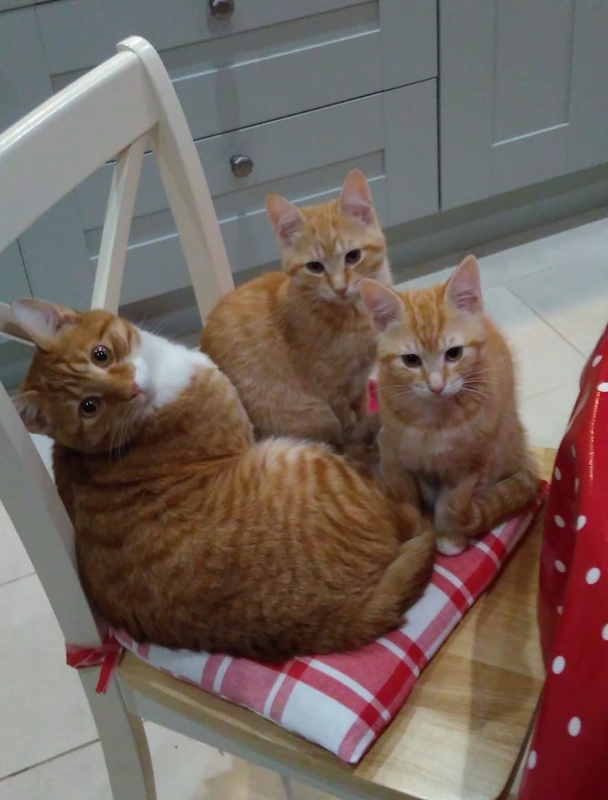 The kittens were adopted in September with the ginger boys being adopted by Jemima, the tabby girls adopted by Jackie & family and Jackson adopted as a single kitten by Kate & family. After spaying and the usual CP vet treatment, Rosie was adopted by Ros in October 2018 where she (Rosie!) is totally adored and rules the house. Pictured are Rosie (through the bannister), tabby kittens at home, Rosie (on the sofa) and ginger boys Rufus & Stanley with housemate Mr Boris.